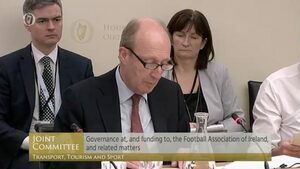 Minister for Sport Shane Ross is currently addressing the Oireachtas sports committee. He’s just said the entire FAI board is to step down. 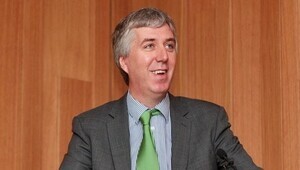 He also said no new capital payments will be made to the FAI until he is satisfied with the new measures put in place. Now @Fergusodowd has said the proper books have not been kept by the FAI. He informs the committee that “Form H4 has been filed with Companies Registration Office yesterday. CRO has received a report from Deloitte to say that accounts of FAI are not being properly kept. Deloitte declared that FAI is contravening section 281 and 282 of the Companies Act. This is not a good day for everyone at the FAI. 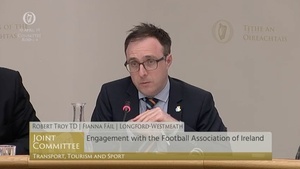 Mr Treacy tells the committee that no other organisation that receives grant funding from Sport Ireland has had a form H4 filed against them to the CRO. He said there is a mechanism to fund on a monthly basis “but that’s an issue when all the various bits and pieces have been done”. Come on journos! Questions about Deloitte and FAI banging around on social media forever but nobody held them to account! 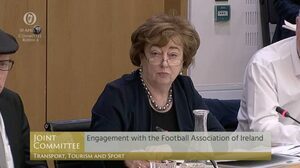 Posted in Misc and tagged FAI, Oireachtas sports committee, Shane Ross at 2:05 pm on April 16, 2019 by Bodger. 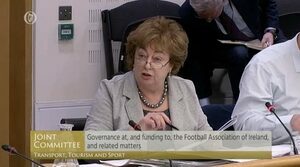 Senior members of Sport Ireland will go before the Oireachtas sports committee to discuss the Football Association of Ireland, its funding, and matters concerning its governance again. Ahead of today’s meeting, last night the FAI sent a letter to the same committee in response to questions that the committee felt weren’t answered when FAI senior members went before it last week. The letter was signed off by interim CEO Rea Walshe. 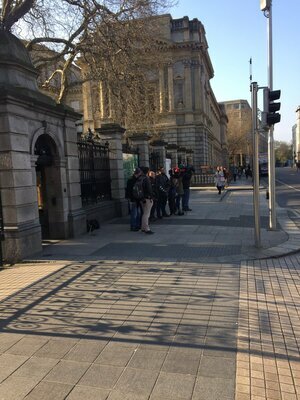 Posted in Misc and tagged FAI, Oireachtas Committee at 12:09 pm on April 16, 2019 by Bodger. Cork City Vs St Patrick’s Athletic League of Ireland match. Sinn Fein TD and former Cork City chairman Jonathan O’Brien was ejected from from Turner’s Cross last night following a protest against the FAI. 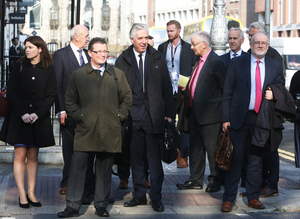 O’Brien – who was part of the Oireachtas Committee that met with the officials of the Association on Wednesday – was escorted out of the ground by Gardai…. 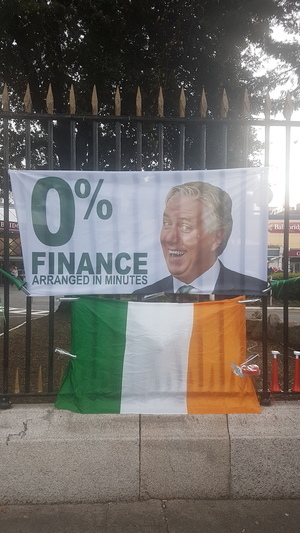 Posted in Misc and tagged Defiant Tricolour, FAI, John Delaney at 9:41 pm on April 12, 2019 by Bodger. Posted in Misc and tagged boycott, FAI at 11:07 am on April 11, 2019 by Bodger. 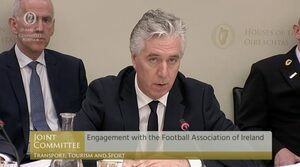 Senior members of the Football Association of Ireland, including former CEO and current executive vice-president of the FAI John Delaney, are appearing before the Oireachtas sports committee. 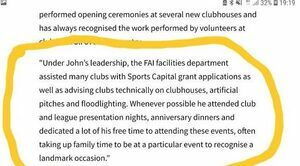 It follows revelations in The Sunday Times on St Patrick’s Day that the former CEO of the FAI John Delaney gave the FAI a “bridging loan” of €100,000 on April 25, 2017 – a loan Sport Ireland said it knew nothing about – and that the FAI paid €3,000 a month in rent for Mr Delaney for several years while he was earning €360,000. Mr Delaney failed to secure a High Court injunction on the eve of St Patrick’s Day to prevent publication of Mark Tighe’s story about the loan. On Monday, the FAI’s president Donal Conway released a statement saying, among other things, that previous comments made by the FAI in respect of the loan “did not accurately reflect the board’s level of awareness” about it. The meeting can be watched live above. 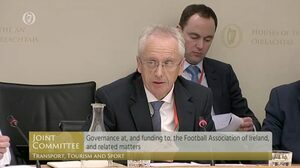 President of the FAI Donal Conway (above) has told the committee that if all cheques issued by the FAI before the week ending April 28, 2017, had been cashed in, it would have been likely that there would have been “insufficient funds” to cover all the cheques. He said it was a “short-term issue” as there was a legitimate expectation of funds making their way to the FAI, via “various income streams”, including from tickets, sponsorship, grant funding and “other sources”. 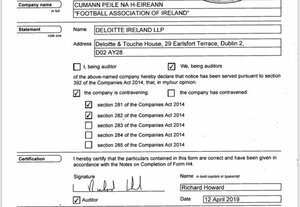 Mr Conway said Mr Delaney’s cheque of April 25, 2017, “provided immediate financial relief” to the FAI – particularly in respect of one creditor’s request to drawdown money from the FAI on April 26. He said the board acknowledges that the circumstances of the loan was “exceptional”, adding that the loan was repaid on June 16, 2017. Mr Conway said no contract or agreement was entered into between the FAI and Mr Delaney and no interest or charges were levied, or paid, by the FAI in respect of the transaction. This is how John Delaney is going to play it at the Oireachtas committee. Mr Delaney speaking at the committee this morning. Social Democrats TD Catherine Murphy is the first politician to ask questions. This is because she was the first politician to raise concerns and request Mr Delaney to come before the committee – last year. 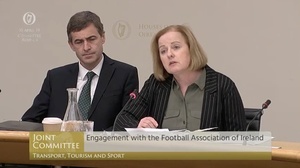 Ms Murphy turns her attention to Mr Conway and asks him about the statement earlier this week in which he FAI said previous comments about the board’s awareness of the loan were inaccurate. Mr Conway said, at the time of the loan, three members of the board were aware of it, while other board members became aware of it on March 4, 2019, during a regular board meeting. [The Sunday Times contacted FAI about the loan on March 1]. Ms Murphy later asks why the board was “kept in the dark”. Mr Conway also told Ms Murphy that, while the board were informed of the loan on March 4, there was a conference call about Mr Delaney’s injunction attempt on March 16 (the night of which the injunction took place). Delaney citing Kerins judgement as he says he cannot not add to statement’s contents on finances. Says he told Hon Sec Michael Cody and then President about the 100k but the matter “did not arise” at the association’s net board meeting. So, Delaney says that he asked Eamon Breen if the FAI had any reporting obligations regarding the 100k and left it hanging there. He is asked by Catherine Murphy what Breen’s response was and says that on legal advice he can’t add anything to statement. Just three members of board knew about loan before March of this year when Delaney told them all following inquiry from Sunday Times. 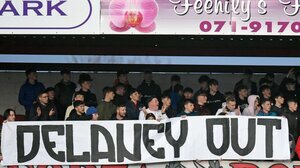 Conway declines to comment on suggestion that it was Dundalk FC who effectively forced FAI to cash Delaney cheque for asking for some of the money they were owed. Fine Gael TD Noel Rock asked if the creditor that wasn’t named – but prompted the need for the loan from Mr Delaney – was Dundalk FC. Mr Rock accepted this and then asked if the “creditor” had made previous requests for funding, before April 25, 2019. Mr Conway said the FAI would have had an “ongoing dialogue” with that creditor”. “I wouldn’t accept that view. I would draw your attention to our accounts each year. I think we’ve had nine consecutive years of profit. I think cash-flow, as I say, can be a challenge to manage but because of the timing of revenue or income streams, that does make it difficult. 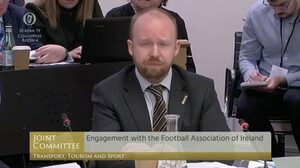 Fine Gael Senator John O’Mahony asked Mr Conway who within FAI made the decision not to inform Sport Ireland about the loan. Mr Conway said it was “an omission on our part”. Mr O’Mahony suggested “somebody made a call” not to tell Sport Ireland. 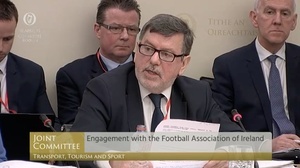 Mr O’Mahony also asked Mr Conway about the FAI-commissioned Jonathan Hall and Associates review – which the FAI claims prompted the change of Mr Delaney’s job from CEO of the FAI to executive vice-president of the FAI (a week after The Sunday Times story about the loan). Asked when the report was commissioned, Mr Conway said “early March”. Asked if there were “no specific terms of reference”, Mr Conway said it was a scoping review. Mr Conway said the completed review was given to the FAI in “late March” and the decision to change Mr Delaney’s role took place “within days”. 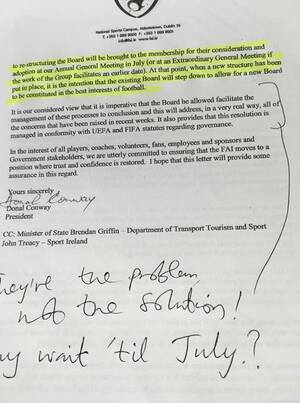 Fianna Fáil TD Robert Troy asked Mr Conway about the hiring by the FAI of Jonathan Hall for the review. Mr Conway said Mr Hall had previously done “considerable work for the FAI” in the area of corporate governance. He then went on to confirm that the review wasn’t put out to tender. 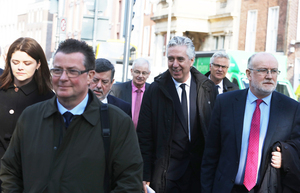 On March 18 – a day after the loan story broke – the FAI released a statement saying the FAI board was “kept fully informed in relation to the matter [the €100,000 loan] at all times”. Conway says he ddin’t sign off on statement saying the board had been kept informed. Says the board did instruct Communications Dept to issue statement. Says authority was “internal” whatever that means. Munster: Some might say that the board as it now stands is not fit for purpose. 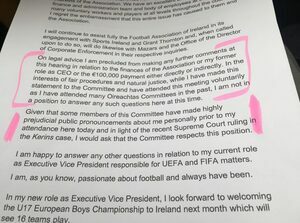 Ms Coppinger put to Mr Delaney that he made it clear in his statement, he will not speak about his former role as CEO of the FAI, or the €100,000 loan, but he is willing to speak about his current role. She asked if it’s fair to say he’s still “double-jobbing” as he currently has two roles – executive vice president of the FAI and being on the UEFA committee. Mr Delaney ultimately said “no” and went on to explain what his roles will require of him. 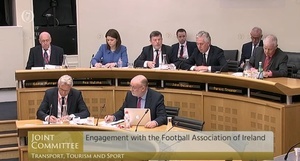 Posted in Misc and tagged FAI, John Delaney, live, Oireachtas sports committee at 4:09 pm on April 10, 2019 by Bodger. 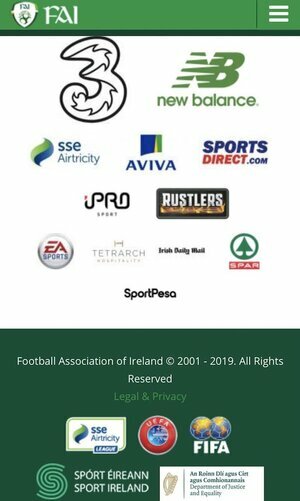 ‘The Board of Sport Ireland at its meeting today (April 9th) has decided to suspend and withhold future funding to the Football Association of Ireland (FAI) in accordance with Clause 1.1 of Sport Ireland’s Terms and Conditions of Grant Approval. Posted in Misc and tagged FAI, Sports Ireland at 4:49 pm on April 9, 2019 by Bodger. 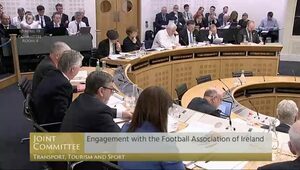 Confirmation from the FAI that its representatives will appear before the joint Oireachtas committee on sport to explain anomalies in their accounts. TDs had given the association until midday today to confirm participation. Posted in Misc and tagged FAI, John Delaney at 4:25 pm on April 8, 2019 by Bodger. 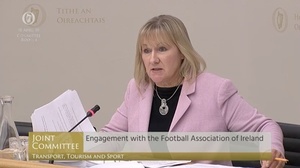 FAI has told the Oireachtas Transport, Tourism and Sport Committee that it will provide a list of witnesses to appear before it this week by around 1pm today or shortly thereafter. That’s according to the committee chairman Fergus O’Dowd. 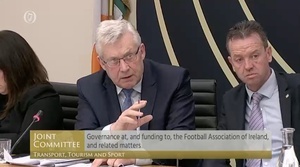 Posted in Misc and tagged FAI, John Delaney, Oireachtas Committee, sport at 2:14 pm on April 8, 2019 by Bodger. 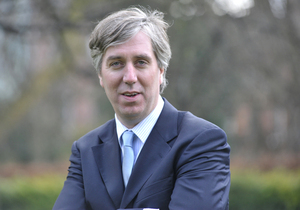 The four provincial football associations released a collective statement praising former CEO of the FAI John Delaney’s contribution to Irish football. 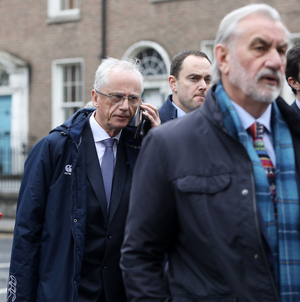 It followed Mr Delaney stepping down from his CEO role and being made executive vice-president of the Football Association of Ireland, days after a March 17 report in The Sunday Times revealed he gave a loan of €100,000 to the FAI in 2017. Almost three weeks on since the story about the loan broke, the circumstances surrounding the loan are still being sought by Sport Ireland while Mr Delaney will appear before the Oireachtas sports committee next week. On the same date as the statement from the provincial associations, March 29, the Dublin & District Schoolboys League also released a statement. The statements are very similar. Then, on Tuesday, Limerick Football Club’s chairman Pat O’Sullivan released a statement expressing the club’s confidence in Mr Delaney. Again, the Limerick FC statement was very similar to those of the provincial associations and the DDSL. Last night, Waterford FC owner Lee Power released a statement praising Mr Delaney. After Neil O’Riordan, of The Irish Sun, tweeted that the figures in the statement were incorrect, the club amended the statement. WOW. 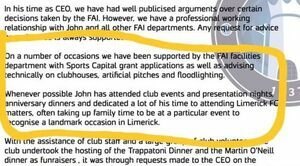 Passage in Limerick FC statement praising John Delaney is, word for word, the exact same as the original statement from the Provincial Councils. Is there a sample being send to leagues/clubs? All so so similar. If any club or League has been contacted and asked to make a statement backing John Delaney and wish to contact us, please get in touch. DM here or email youboysingreen@gmail.com Total anonymity, of course. Posted in Misc and tagged FAI, John Delaney, Kevin O'Keeffe, statements at 12:56 pm on April 5, 2019 by Bodger. 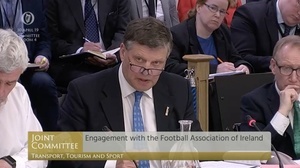 The Football Association of Ireland (FAI) has commissioned consultancy firm Mazars to conduct “an independent and in-depth” review of “issues of concern” that have been raised about the association. 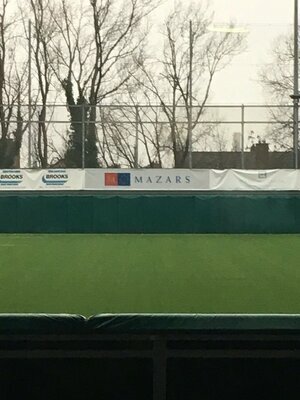 Posted in Misc and tagged FAI, Mazars at 10:16 am on April 5, 2019 by Aaron McAllorum.